Attack knob - The attack time is the time it takes to lower the volume when the input volume is over the threshold. Release knob - The release time is the time it takes to return the volume to normal when the input volume is under the threshold. Mode - In RMS mode the compressor will measure the volume using the root mean square method, which gives an accurate measurement of audio power. 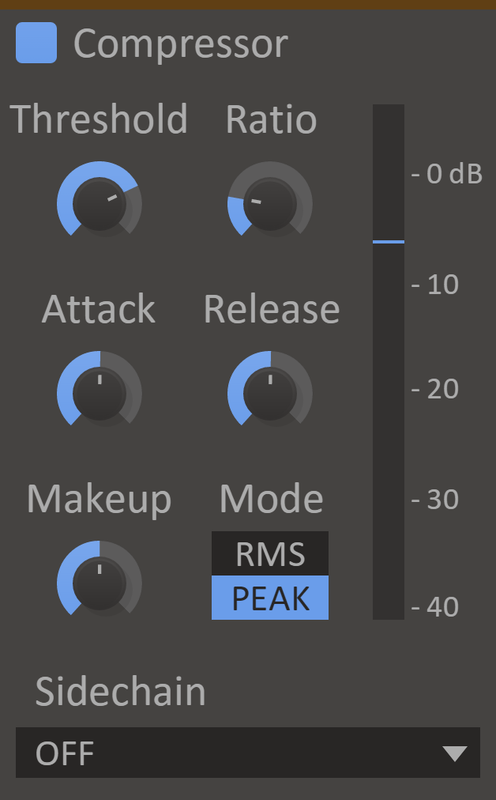 In peak mode the compressor will follow the peaks in the audio waveform, which makes it more responsive to transients. Ratio knob - The ratio decides how much the compressor will reduce the audio volume. At 1:2, for example, the volume will be lowered until it is halfway between the input volume and the threshold. Threshold knob - The threshold for when the compressor will start lowering the volume. Makeup knob - The makeup gain will increase the volume of the output signal to compensate for the loss in overall volume that the compressor causes. VU Meter - Displays the current input level, the selected threshold, and the compressor's current attenuation. Resize handle - The bottom right corner of all Kilohearts plugins is a resize handle for scaling the UI to any size. This allows you to get a good view of the controls whatever the screen resolution, and also comes in handy if you need big controls, e.g. when using Compressor as a real-time effect on a touchscreen monitor during a live set. (This is not available when the snapin is used inside a snapin host.). Compressor shines on it's own, but it was primarily created to power up the different "Snapin Hosts" Kilohearts offer. These are bigger effects units that utilize all the available snapins and give you a really fun and creative workflow for combining them in any way you can think of. So have a look at Snap Heap and Multipass right now. Compressor is also available as a Rack Extension for Reason over at the Propellerhead shop.